Posted on June 15, 2017 . 6 Comments. “When do I know when I can move up to the next bell?” is a question that pops up quite often on the StrongFirst Forum. This is one of the best questions someone can ask, but it can also indicate a risky time for a beginner or novice girevik. Moving too quickly could leave room for an injury, but moving too slowly may cause delay on your strength journey. 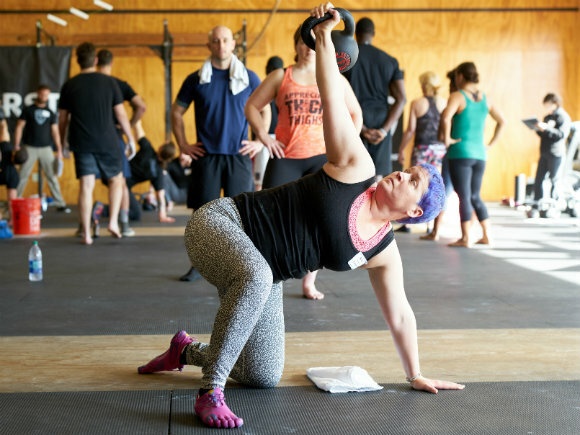 Knowing when to move up to the next heavier kettlebell is a vital component to mastering the skill of strength. Once you are able to perform an exercise and hit all of the technique points laid out for that particular skill, it’s time to start challenging that exercise with new loads. 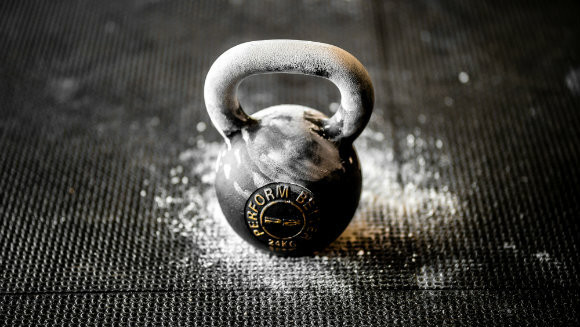 But generally, kettlebells increase in four-kilogram increments, or just shy of nine pounds, and a four-kilogram jump can sometimes seem like a ton. At StrongFirst, we talk about “owning a bell” before moving on to the next bell up. Understanding what is meant by this will assist in your journey toward greater strength. 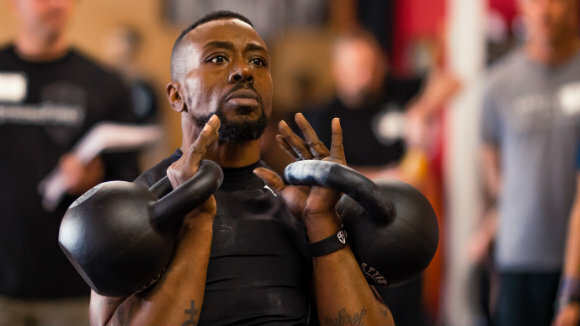 For me, kettlebell ownership comes down to three concepts: control, confidence, and competence. Being able to move through a chosen exercise or movement with one’s current bell while observing the three Cs is a good indication that you maybe ready to start working with a bigger bell. 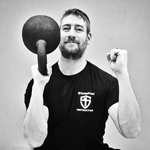 Being in control of the kettlebell is job one, because job one with StrongFirst is safety. In fact, being in control of your bell and demonstrating safety at all times are part of the requirements when participating in a SFG Course or Certification. Not to mention, putting in the work to own a bell is extremely rewarding. There are few things better than feeling in complete control of a bell that was previously mismanaged. There are no wobbles, especially speed wobbles, during the entire movement. The movement must be performed the same on the left as it is on the right, where applicable. There should be no difference between the concentric action and the eccentric action. Meaning, the way up should look the same as the way down. The whole movement should look and feel smooth, with no sticking points. Add a pause or a press at each position in an exercise: This is a great way to highlight any current weak spots. In the get-up, pausing and/or pressing in each position can be a game changer for your appreciation of your ability to perform it under control with that bell. For example, if there is an issue stabilizing the bell while holding the windmill position on either the way up or the way down, or you lose tension/balance when pressing in the tall sit position, it could be a sign you could benefit from some additional stability/motor control work. Video tape yourself performing the exercise: Watching yourself performing an exercise is a great way to get a new perspective on that exercise and can take some of the subjectivity out of its performance. You may not be aware you are rushing through transitioning from standing to the half kneeling. This may prompt you to add some pauses and help you own that sticking point. Bonus drill: In my humble option, the greatest test of control with a movement/bell would be to move through it with the bell in the bottom-up position. The bottom-up position will shine a spotlight on any strength leaks you might have. It can be an a-ha moment for some when rolling to the elbow and up to the tall sit position in the get-up with the bell in the bottom-up. It will force you to figure out proper bracing and where to get the strength to initiate the get-up. This position will obviously get more challenging as the weight of the bell increases, and may not be a deal breaker in the decision to move to the next bell, but could be considered the ultimate demonstration of control. Remember that we want to search out weaknesses and make them strengths. Using drills such as the above will help you identify any areas that require attention. Exhibiting authority over a bell and controlling all portions of a given movement are good indications you are approaching readiness to move on. Now, with any good system, there must be built in redundancies to ensure we don’t let potentially hazardous factors slip under the radar. So as we move on to the next two Cs of kettlebell ownership, you will see some of the same concepts arising and building upon each other. When we talk about confidence, we talk about a feeling of self-assurance arising from your appreciation of your own abilities. Being able to move through a movement without any concerns. The ability to demonstrate the exercise at any time, with the proper warm-up if needed. The movement should appear “effortless,” with no sticking points. Confidence, like control, comes with time, practice, and patience. Being in control or feeling more in control than the previous practice sessions is great way to develop confidence. Taking your time with drills and working through tough spots can seem tedious, but that’s why we call it “practice.” To earn the skill of strength is to become an expert in a chosen movement. There should be an absence of doubt with the movement and the bell. Owning a bell means being able to pick it up and perform with it, practically, at will. The chosen movement will become almost a meditative state. You will still be present during the exercise, but you will move though it without having to think about controlling every step. There is a certain level of unconscious reflexiveness when you are confident with a movement. This concept is fairly subjective and takes a degree of self-honesty. The strength journey isn’t a race, and only the girevik will truly know his or her level of confidence with a bell. When in doubt, stick with your current bell. As the samurai maxim says, “Tomorrow’s battle is won during today’s practice.” However, there are few better confirmations of confidence than when after performing a challenging get-up, you’re told that it looked easy. To be competent is to have suitable and sufficient skill, knowledge, and experience in a particular exercise. Again, like the previous Cs, it takes time to develop competence with a movement. Having no asymmetries, left and right look very similar. The absence of compensations, not sacrificing stability or control in one place to gain it in another. The ability to communicate effectively about the movement with other practitioners and perhaps the layperson. Possibly being able to coach or teach others the exercise. Being able to demonstrate the skill without any asymmetries or differences right to left as well as having no compensations is paramount. Competence is where some of the fine tuning comes into play and where attention to detail pays big dividends. If the right hip dumps as your move from the lunge to standing during a left side get-up, there is still some work to be done. These are the little things that bring owning a bell into focus. 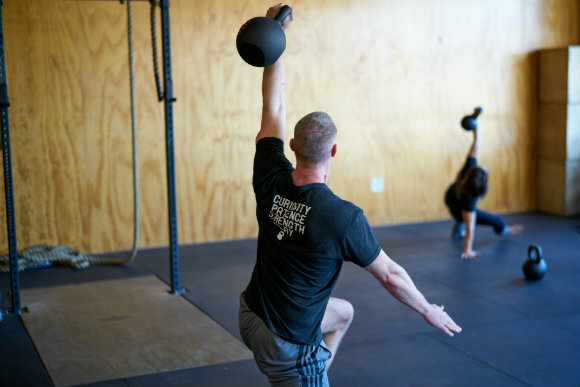 Competence isn’t limited to the kettlebell and is, in fact, more tied to the chosen movement than the other Cs. There is some carryover from one exercise to another when we speak about control and confidence. There can be an increase in the control and confidence with the press after practicing the get-up. However, the knowledge and experience you have with the get-up with a 16kg bell will evolve and grow as you graduate to using the 20, 24, or even 40kg bell. The same can be said of any movement or exercise. As the weight of the bell increases, there will be new lessons and a new level of competence with that particular movement will emerge. I’m a firm believer that the experience of teaching something is one of the best ways to further your understanding of a particular topic. Once a certain level of competence with a skill is reached, your ability to relay the information to another is heightened. The mistakes or sticking points once experienced become more obvious in others, as well does the ability to convey drills or visualizations that helped with getting past those sticking point in your own journey. It is likely that the question of when to move up to the next kettlebell will remain an eternal one. But remember, the strength journey isn’t a race. When in doubt, always err on the side of too slow. There is much to be learned from a relatively light bell and there is even great benefit in returning to lighter bells as part of regular practice. Ownership of your current bell doesn’t have an expiration date. In fact, you could argue that a greater understanding will come with a more patient progression from one bell to the next. But when you feel ready to make the move to the next bell, be sure that control, confidence, and competence surround the bell you are currently practicing with. Thank you for this: good reminders and accessible information for many of my students. This is great! I am beginning to focus more on Kettlebell training and am looking improve my technique and stamina. Thanks, David. It’s all fixed now!